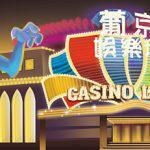 Halloween slots have and will continue to be some of the most popular casino gaming experiences out there. Though there are many Halloween games online, there’s nothing quite like the thrill of the slot spin, and when you score that big win the feeling of exhilaration will keep you coming back for more. 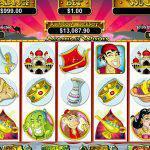 Want to take your slot gaming up a notch? Video slots are just the ticket you’ve been waiting for. Here for Halloween, CoolCat Online Casino has a list of spook-tacular video slot games with chances to win seriously large payouts that are downright scary. Are you brave enough to play? Sign up and play Halloween slots at CoolCat Online Casino! Winni the witch allures you with her spellbinding ways and witchy magic in this CoolCat Casino favorite while you hunt for big wins. With 50 paylines and scattered cauldron symbols; the black cats and crows ensure exciting gameplay that will have you waiting for that doll of a witch to make an appearance, she counts as the wild. Try the seductively spooky Bubble Bubble game today! 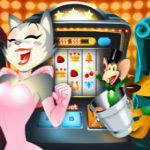 This sequel to the popular Bubble Bubble video slot game will enchant you to enter the witching world of Winni and Wanda (the Wild Witches). Throughout the game you’ll enjoy the eye-candy as the wicked sisters use their magic wands to dish out scatter symbols and ghost wilds that give free spins, game multipliers, bonuses and much more! Secret potions and spell books spin on the reels as you discover the spooky world of these two foxy witches. Features – Great video graphics, scattered wilds unlock 1 of 3 exciting features: Wilder Witches, Creater Ghosts and Ultra Bewitched; enable bonuses, multiplier bets, up to 33 free games, and much more! Beware not to fall under the witch’s spell or you might end up in her brew. Witches Brew is fantastic for those fond of films like Hocus Pocus and other Halloween favorites. 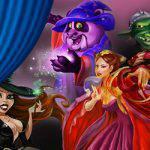 It’s a great witch-themed game that offers 25 paylines, double prizes and bonus features. 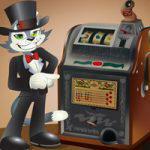 Though it doesn’t have a jackpot, the wilds allow you to win up to 10,000 times your original bet! Take a haunted Ghost Ship trip through the seven seas with this fun slot game, as you follow the Ghost Captain on a quest to seek your own spooky treasure. Murky waters hide plentiful riches, but just be sure not to fall victim to the haunted pirates and scallywags that roam the haunted oceans for fortune as well. For fans of monster movies and games alike this Monster Mayhem video slot is a real treat. It comes complete with 50 paylines and some monstrously large prizes. Watch the beasts battle it out while you spin for that City scatter symbol, and play for winning combinations with the monster wilds. This one’s sure to have you howling with excitement! In the heart of the swamp you’ll find a real spooky treat as you are bewitched by the voodoo queen’s glowing gaze. This captivating game of dark magic and high stakes comes complete with voodoo dolls, spell books and victims’ skulls. With 13 paylines and a hypnotic drum beat, Voodoo Magic will have you swaying to a rhythm that just might conjure the souls of the undead if you’re brave enough to face them! 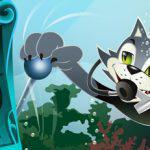 In the valley of the Wild Wizards you’ll find some spellbinding prizes and more as you play this exciting slot game. Potent potions, wise owls, and the sound of the wild wizard’s staff striking the ground ensures that you’ll be earning some real sorcerous winnings. Players can enjoy magical features that multiply their bets up to 500x per line in this fan favorite Halloween game online only at CoolCat Casino. When you play to win it counts and who better to know this than the count himself in this vampire video slot adventure. Players can really sink their fangs into up to 50,000x line bet winning potentials, free games and multiple random jackpots. Ghouls and gals can choose from these ghastly Halloween games online, along with our popular table games, and much, much more at CoolCat Online Casino today! Play now for a chance to win real money or practice just for fun.